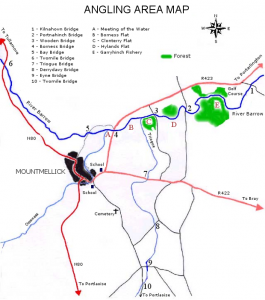 Mountmellick Angling Association are situated in the middle of Ireland in County Laois just 80km from Dublin and only 10km off the N7 motorway nestled under the Slieve Bloom Mountains with their fishery situated in the upper most region of the river Barrow. 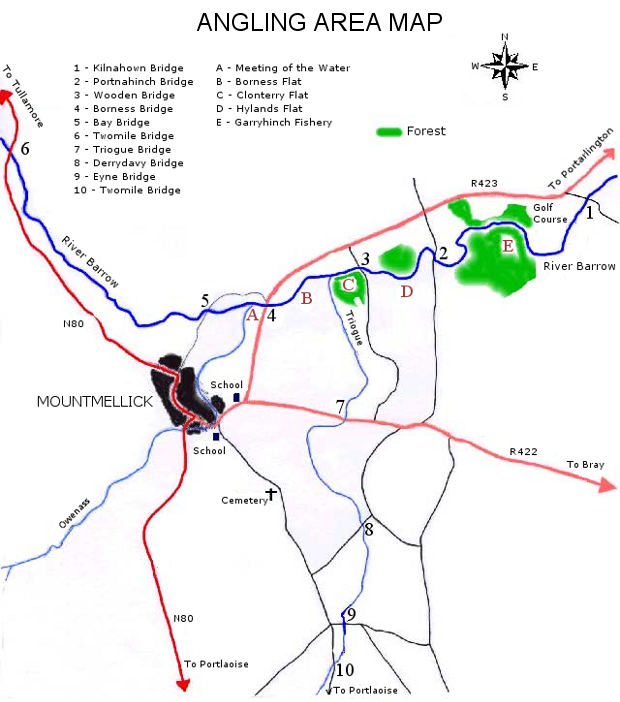 The association was formed in the mid sixties by a local group who wished to provide and develop angling in the Mountmellick area. Membership increased over the years and at present stands at two hundred. The fishing is predominately for wild Brown Trout, no stocking takes place as there are excellent spawning grounds in the rivers and natural regeneration takes place, providing wild Brown Trout. The fishery consists of three rivers, the Barrow is the main river, and with the Owenass and the Triogue being tributaries. As with all fisheries there are favourite locations, the main ones being, the Bornass Flats, Clonterry Flats, Keegans, Portnahinch and Garryhinch Forestry. These locations are shown on the map and are sign posted. These locations are between Mountmellick and Portarlington on the R423. The Trout average between half to one and a half pounds with the occasional fish in the two to four pound bracket. One of the biggest fish caught in recent years weighed in at a whopping five pounds ten ounces! The Association is subject to state laws and by-laws re the fisheries act. Main association rules are printed on their permit cards. The Association encourages catch and release and requests all anglers to observe the countryside code as we rely on good relations with local landowners for passage through the fishery. When wading please show consideration for other anglers. Please leave nothing but your footprints and remove all rubbish. Development of the fishery is an ongoing process. In recent years, major tributaries, drains and land boundaries have being bridged and stiled. The fishing season is from the 17th of March to September 31st Spetember. An adult permit for the season costs €30 Juvenile and Students permits costs €5 with old age pensioners free. Day tickets can also be purchased for €10. Membership is open to all, subject to Association rules and conditions. Permits can be purchased from Victor Cox’s Shop O’ Connell’s Square Mountmellick. Fishing tackle and local advice also available from Ivor Cox proprietor. The Association currently have two Court appointed water keepers who patrol and monitor the fishery to insure that association rules are adhered to. Tommy Quigley (00353 86 3220725) and Paul Lalor (00353 87 6264791) are the water keepers and are available for advice.